Contra Rebirth Preview: Surprise, It's Tough! I played Contra Rebirth on the Wii today and died. And died. And died. And died, died, died. Then: died, died, died. Could I have been halfway through the game's first level? 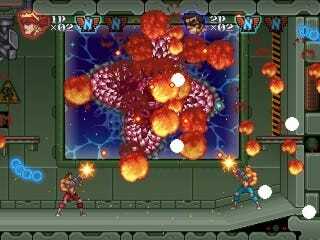 Contra Rebirth brings side-scrolling Contra back to a Nintendo home console in the form of an all-new Contra that sports the 16-bit graphics, gameplay formula and murderous difficulty of the the classic older games in the series. The game is coming out next week. I bet it's done. Time-Warp: Commander Salamander might have warped himself back to 1973 AD, but you can get in a warp of your own with this game. This new one is pretty much a SNES game in terms of graphics. It is indistinguishable from my memories of the Contra I played on that system — except that my adventure here started in a space station, featured purple aliens running at me and a space worm flying outside against the starry depths.I thought we were supposed to be on the Yucatan peninsula. Maybe I would have been able to determine what was going on had I reached the end of level one, but even the Nintendo rep showing me the game, who had been playing since yesterday, couldn't. If you want nostalgia, then, this'll do, I think. You get the spread shot in the first 10 seconds. That part's right. Classic Controls: There's no Wii re-invention here. The game is played with the Wii Remote held like an NES controller. D-pad runs. Face buttons jump and shoot. I can't tell you a whole lot about a game that I was terrible at. Except that it was awfully tough and felt like the oldest of old-school Contras. Konami's fact-sheet indicates that the game has two-player local co-op. A second soldier might help make things easier. Check the game out yourself when it's out on WiiWare next week. But, buyer beware: There are no refunds if the game proves to be too hard.